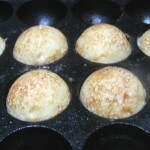 Akashiyaki is very similar to Takoyaki, but there are some differences. 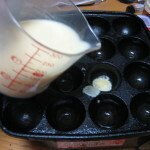 The ingredient of Akashiyaki is only octopus (tako). On the other hand, Takoyaki sometimes uses others like cabbage, red ginger, green onion in addition to octopus. And Akashiyaki is served with a soup, but Takoyaki is served with sauce. Takoyaki is originated in Osaka and now is popular food country wide. 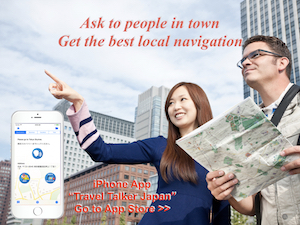 Akashiyaki is originated in Akashi city where is about 40 km west from Osaka. And it has longer history than Takoyaki. 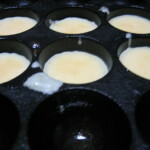 In Akashi area, it is called as “Tamagoyaki” that means baked egg. 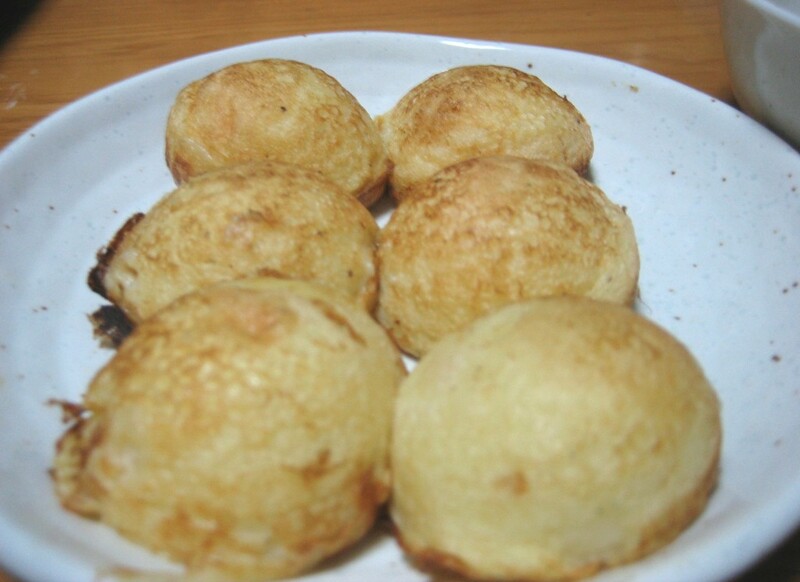 I prefer Akashiyaki to Takoyaki because I think its taste is more sophisticated. I also think it is even as another form of Chawanmushi (Japanese egg custard) which is one of Japanese traditional foods. 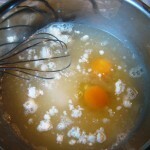 1) Combine flour, potato starch, eggs and broth in a bowl and whisk them until it becomes very smooth. If the powder of flour is remained, the taste will be worse. 2) Cut octopus as bite size. 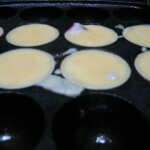 3) Heat Takoyaki plate well on the stove and pour cooking oil. 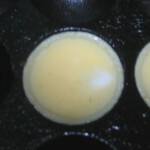 4) Turn to small heat and pour custard about half of hall. Put an octopus in each hall, then pour custard until top of the hall. 5) Heat it on small heat for a while. 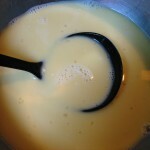 When custard is baked, it becomes hard from edge and turn to white. If it becomes about 3mm, flip it over with using chopstick or something like ice pick. To clip it over better, stab chopstick at the edge and swing it quickly. 6) When another side is also baked, pick it up. 7) Making soup is to heat broth with a little sea salt and soy sauce. 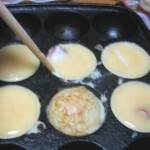 To eat, dip Akashiyaki in the soup and put some mitsuba on top. If you can’t eat octopus, shrimp or squid will be good. At this time, I tried shrimp which is boiled with sea salt and water. It was very good. 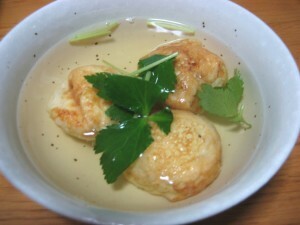 Also some ingredients which is used for Chawanmushi may be good. For example, Shiitake mushroom, fish paste, ginkgo, chicken etc. You can use Shirodashi instead of broth. I sometimes use it and dilute with water according to instruction to make Sumashi Jiru. In case of Somi Shirodashi which I am using, the ratio is Shirodashi : Water = 1 : 13. I mentioned Akashiyaki has longer history than Takoyaki before. It seems to be made around mid of 1800s. One story is saying that there was similar food in Osaka, but it was not using octopus. After that, Osaka people got know octopus is used in Akashi area and then they also used. So it is called as Takoyaki (tako mease octopus). 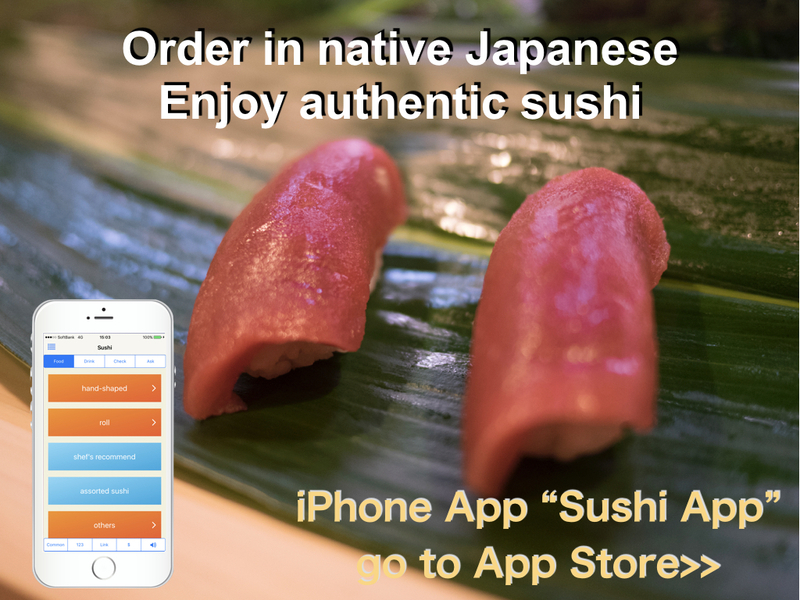 Akashi city is well known for octopus which are caught near there and they are delicious. Actually octopus caught near Akashi is expensive than others. You may have not seen Takoyaki plate. They are available on amazon.com. I picked some of them as the reference. Left one is as same as I am using, but it need to heat on stove. Center one is electronic type, so you can use it on the table. Right one is also electronic type and it can change pan. 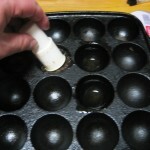 So you can use other purpose like making pancake or hot pot.